The JForex charting and trading platform is a rather unique free to use platform, mainly offered by Dukascopy. The JForex platform is based on the JAVA programming language and is relatively easy to install. Because of the JAVA language, the JForex platform is OS independent and works across Windows, Mac OS or Linux. The JForex platform is widely known for building automated trading strategies and comes with over 200 trading indicators that you can use. Other benefits of the JForex platform include the full market depth and option to place bid and offers on the market directly. The JForex platform also supports native Renko charts, meaning that there is no need for using additional indicators. 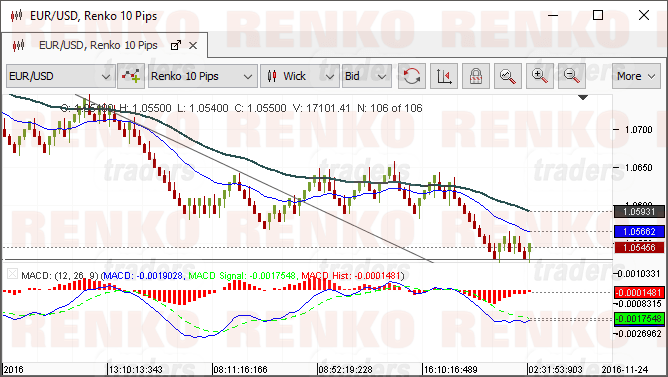 In this article you can see the features provided by JForex to trade with Renko chart types. 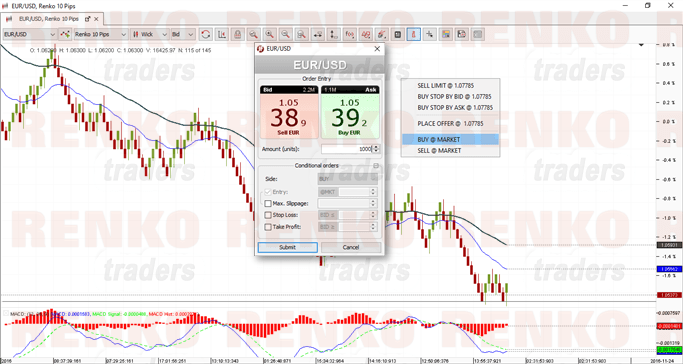 On the JForex platform, you can change the Renko box size by going to the main settings. To do this, head over to Tools > Preferences > Period and select the “Price based periods” option. Here you can select the type to Renko and a Renko box size of your choose. You can choose from as little as 1 Pip to 1000 pips. Once you add a custom Renko box size on the main settings, these can then be directly accessed from the drop down. The picture below shows the newly added 10 Pip Renko box size. Note that it takes a while for the Renko chart to be populated. Once done, you will be able to view the native Renko charts on JForex. 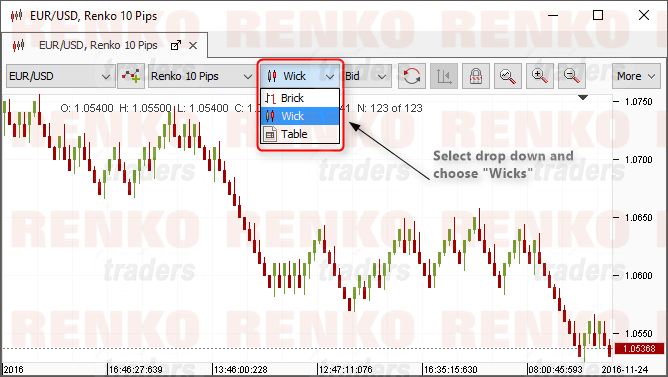 After the chart is populated, make sure to select the dropdown in the chart and change the settings from ‘Brick’ to ‘Wick’ to have the Renko boxes with the wicks to show up on the chart. Selecting ‘Brick’ will plot the Renko boxes without any wicks. Te JForex platform has a good collection of drawing tools and trading indicators. It is relatively easy to plot drawing tools on the chart or adding indicators, making it easy to analyze your markets based on the Renko chart. There is also not much of learning curve which means that you can install and start working on the JForex Renko charts with relative ease. The chart below shows a trend line, a horizontal line and some indicators applied to the Renko charts. Note that you can completely customized the drawing tools and also change the indicator settings. You can also save the templates directly so you don’t have to keep adding the indicators every time you open a new Renko chart. The JForex platform makes it easy to trade directly from the charts. Simply right click and select the market or limit orders that you want to enter. The chart below shows the steps involved in placing orders directly from the Renko Charts. Overall, the JForex platform is pretty simple and easy to use. JForex platform has the advantage of running on JAVA language, making it platform independent. More importantly the ability to offer support for native Renko charts allows for traders to build automated trading strategies on the JForex platform as well. If you are interested to test drive the JForex trading platform, then click here to get at 14-day trial.